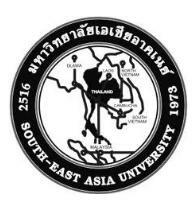 South-East Asia University is a private university under the Office of the Higher Education Commission. The South-East Asia College was granted to set up in 1973 and transformed its status into a university in 1992. 1973 South-East Asia College was granted to set up on August 6,1973 , stipulated by Private College Act. The Faculty of Industrial Technology was first founded. 1975 Ministry of University Affairs took control of the University according to. Article 75(1) of Private University Act, B.E.2522 (1979) as amended by Private College Act, B.E. 2512. Deputes Permanent Secretary Dr. Wichit Srisa-arn was a chairman of the Board of Trustees. 1982 Ministry of University Affairs set aside the College’s control after the College’s 18-rai plot of land had sold for its financial recovery. At the same time Khunya Plak Muenpiew Foundation took change of the College whereas Mr. Polakrit Pramothaka, chairman of the Foundation, took office as a chairman of the Board of Trustees. 1984 The College conferred an honorary doctorate in General Business Administration on Col. A-Thorn Chonhenchob. 1985 Establishment of the Faculty of Engineering, first leading to a Bachelor’s Degree in Electronics Engineering (a four-year program). 1987 Faculty of Business Administration offered a Bachelor’s degree (a four-year program) in Finance and Banking, and Personnel Management. Faculty of Engineering offered a Bachelor’s degree (a four-year program) in Electrical Engineering. Graduate School provided a Master’s degree in Business Administration (a two-year program), evening class. 1988 Faculty of Business Administration offered a Bachelor’s degree (a two-year program) in Accounting and Marketing. 1989 Faculty of Industrial Technology offered a Bachelor’s degree, a two year program, in Mechanical Engineering, Civil Engineering, Electrical Engineering, and Electronics Engineering. 1991 Faculty of Business Administration offered a Bachelor’s degree, a four-year program and continuing two-year program, in Business Computer. 1994 Faculty of Industrial Technology’s Bachelor of Industrial Technology program and Diploma program were transferred to the Faculty of Engineering. 1995 Foundation of the Faculty of Arts and Sciences conferring Bachelor’s degree program in Business English and Computer Science. 1996 Establishment of Faculty of Law, Offering a Bachelor’s degree in Law, a four-year program, night class. All Diploma program of study were closed. 1998 Bachelor’s degree in Engineering , three-year program of study, was offered to those who finished a Diploma in related fields. Mr.Prasert Samalapa took office as chairman of Khunya Plak Muenpiew Foundation in place of the late Mr. Polakris Pramothaka. 2000 Faculty of Law offered a Bachelor’s degree in Law, a four-year program, evening class, Graduate School offered a Master’s degree program in Engineering Management, a two-year program, evening class. Graduate School offered a Master’s degree program in Public Administration, a two-year program, day and evening class. Graduate School offered a Master’s degree program in Business Administration, a two-year program, day class. The University offered a second degree program for graduates after completing their first degree. The University conferred an honorary doctorate in General Business Administration on Mr. Thanachai theeraphatanawong. 2002 Faculty of Engineering offered a new baccalaureate degree in Industrial Engineering , a four-year program, full-time and part time class. Improved curricular for Bachelor of Accounting and Master of Business Administration, a four-year program and a continuing program. Improved curricular for Bachelor of Arts in Business English and Bachelor of Science in Computer Science, a four-year program, full-time and part-time class. Improved curriculum for General Education courses, Bachelor’s degree. Improved curriculum for four-year Engineering degree (full-time and part-time program) and three-year Engineering degrees (full-time and part-time program) for applicants who finished a diploma in related fields. South-East Asia University is a leading private university in Thailand. The University has made an effort to develops students’ life with inspiration on following the teachings of Lord Buddha. Thus , our intention is to provide educational services based on a non-profit basis in which our students are encouraged for voluntary commitment to social responsibility and mutual cooperation for the advancement of the University and the nation. South-East Asia University is committed to developing our graduates in a combination of knowledge and ethics and enables them to create both of knowledge and apply technology with research processes in both local and global setting. Our graduates are expected to contribute effectively to benefit local communities industry and the profession, including traditional Thai culture. To develop students’ quality of life. To employ modern curricular and benefit students from outstanding employment opportunities. To advance students with edutainment and real-life learning. To enable students to stretch the boundaries as well as the enhancement of knowledge with ethics.